A great celebrity mask of the voluptuous cook that is Nigella Lawson. Great fun for dinner parties. Hi I have had one for three months and use it to impress my friends when entertaining, when sat down I call "Nigella.... more food gargoyle" and then tell my guests i'm going for a pee...I then dash to the Kitchen don the mask and a blue chiffon dress and serve up the starters, I don't think I've been caught out yet as my guests always ask for her number and make comments like ummm delicious...superb...snort snort snort....grunt grunt grunt. 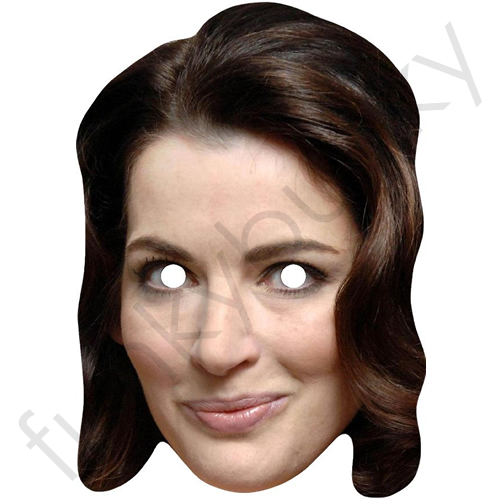 This Nigella Lawson mask is fantastic, it has saved my marriage, I was struggling to look at my wife generally, but since buying her this great mask our relationship has gone from strength to strength. Please be aware that my wife might be purchasing a Daniel Craig mask for me soon. Many thanks.